You'll probably know director Brad Bird from the incredible Pixar animated features 'The Incredibles' and 'Ratatouille', and his move into the live action arena with 'Mission Impossible: Ghost Protocol'. 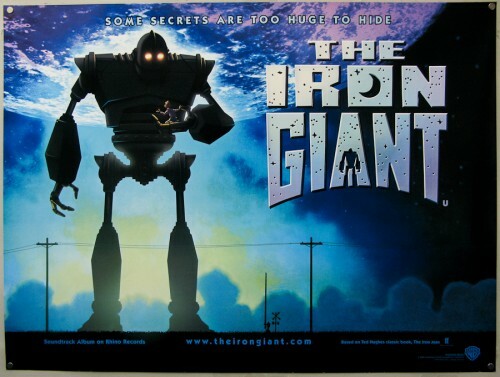 However, his breakthrough came in 1999 with 'The Iron Giant' - a heartfelt adaptation of Ted Hughes' 'The Iron Man' that appealed to adults and children alike. Set in 1950s suburban America, 'The Iron Giant' sees a young child named Hogarth meet a robot who has crashed on Earth. Far from being fearful of the behemoth, Hogarth comes to its aid and the duo strike up an unexpected friendship. Their innocent relationship soon becomes threatened as the authorities begin to investigate and the giant's terrifying arsenal is revealed. The film superbly balances a tale of warm friendship with the bitter political situation and paranoia of the Cold War. Director Brad Bird's forté has been his impressive action sequences and 'The Iron Giant' has plenty to offer in this regard. However, it excels in the emotional aspects. The film's central tenet of "you are who you choose to be" is reflected magnificently in the dramatic final minutes of the film - one of the most tearful scenes in the history of cinema. Quite remarkably, the giant is voiced by Vin Diesel - one of his earliest, and best, film roles. Jennifer Aniston and Harry Connick Jr also lend their voices but like any good animation, your investment in the characters is so deep that the actors are of no concern. It's near impossible not to be consumed by the poignancy of the film as it progresses. 'The Iron Giant' remains well-loved by critics but unfortunately escaped many audiences outside the US. Indeed, even in the US, it was considered a box office failure due to the "non-marketing" of the film. A particular shame as it was certainly the career highlight of screenwriter Tim McCanlies and perhaps Bird's finest work thus far. Watch 'The Iron Giant' today at 15.05 on Film4. Purchase on DVD at amazon.co.uk.